I can be a real BBQ snob. This best hamburger pattie ever (seriously) is the only one I love because it jammed full of onion, parsley, worcestershire sauce, garlic, tabasco and good ole tomato sauce. A truly delicious hamburger pattie can be eaten on its own, and that is how I often eat this one. Look, I am not going to flat out lie and say I never put the thing in a bun and add dodgy stuff plus cheese and sauces to it, because of course I do and its all good, in fact it’s all awesome. But I also love it on its own with a green salad – super scrumptious and no extra sauce needed. This burger rocks the plate. Take care with handling the thing though, as like all brilliant things, it can be a touch sensitive but holds its shape well if the maker is gentle. Sure I could add more egg and make it as stiff as a wooden spoon stick, but this is a goddamn burger pattie and it should be a tad crispy on the outside and nice and soft on the inside and brimming moisture and of course….wham bam thank you mam flavor. Enjoy. The addition of so much parsley to the burger mix adds about 15% of your daily vitamin C allowance in each patty and tastes delicious. 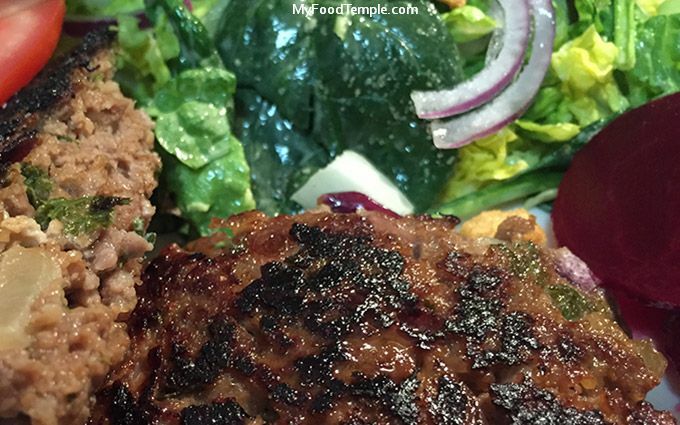 Vitamin C helps absorption of more iron, so beef combined with parsley is a match made in heaven/a burger for those who want to increase iron absorption and energy levels. The iron in red meat is more readily absorbed than the iron in plant foods and red meat contains loads of vitamin B12. Lately I have really increased by intake of red meat and it has massively increased my energy. Most of the time, I have a plain burger patty with salad as my system feels a lot better when I do this (as opposed to having a burger in a roll). I must confess I had run out of brown onions when I made the burger in this photo and substituted purple/red (spanish) onion this once. But brown onions work best with this recipe and don’t substitute unless you have no choice. I cannot believe I ran out of brown onions, and quite frankly, I feel like a bit of an idiot, as this never happens. However, in the spanish (purple) onion’s defence, it is my first choice for salads and mexican dishes and on hamburgers, but just not in hamburger patties. Serving Suggestion: Serve with a salad of cos lettuce, spinach leaves, spanish (red/purple) onion, tomato slices, balsamic dressing, boiled egg, avocado, toasted pinenuts and beetroot – delicious and very satisfying. Olive Oil - 12 x 1.5 second spray on each side of each burger just before cooking. Place in fridge for 30 minutes before cooking to ensure they keep their shape. Then freeze raw or cook. To cook: spray each side with olive oil and place on a medium frying pan or BBQ grill until cooked through - usually about five minutes each side (will depend upon thickness though). FREEZING: Freeze them raw. These freeze raw beautifully and are easy to manage if you wrap each pattie individually in a freezer bag. I always have these frozen raw burgers in the freezer ready to defrost and throw on the BBQ for a perfectly yummy meal any time. SERVING SUGGESTION 1: Lightly toast the outsides of a hamburger bun. Smear fresh avocado on the bottom, add smoky chipotle tomato relish, add burger, add melted cheese, add thick tomato slices, add salt, add pickles, add spanish onion, add lettuce, add mayonnaise, place top of burger on bun and enjoy! SERVING SUGGESTION 2: Of course you can serve it in a bun with loads of stuff like pineapple, lettuce, onion, cheese, bacon, mayo and tomato. But for a healthier equally scrumptious version, serve the burger (no bun) with a salad of cos lettuce, spinach leaves, spanish (red/purple) onion, tomato slices, balsamic dressing, avocado, tomato and beetroot, sprinkling of tasty cheese - delicious and very satisfying. If I don't have avocado, I use boiled eggs instead and sometimes add a ring of pineapple.